A DESK OF MY OWN - it's taken a while (I first started planning this area in November) but anyhow here is my finished desk/home office nook/space. It's in our bedroom where previously there was a wall mounted TV (left by the previous owner) and unpacked moving boxes. Here I work, blog, read, escape and drink tea. Being away from the rest of the household allows me to focus and I'm getting a lot more done than I ever did at the kitchen table (the hub of the house, too busy). Hubs as you may know works from home so I have little access to his desk area in our lounge during the daytime. Much as hubs is my homie I still need space... and this feels like mine... very grown-up. Trying to give my desk area character but keeping it simple has been the hardest part. I struggle with minimalism being too plain but at the same time I don't like too much visual clutter. Also, I had a tight budget with just a little cash left over from moving house. 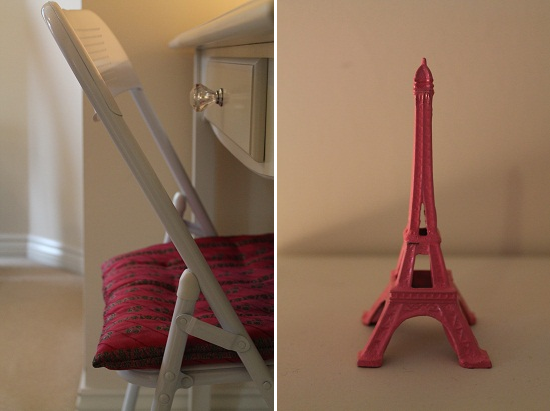 Some items are new, others made by me/us and some are favourite items too, such as my spray painted Eiffel Tower. I originally wanted a vintage desk but I didn't have any luck (or ran out of patience) and my dream lamp would have been a vintage anglepoise. But, that's not to be. I feel I've got a similar look within a tight budget and I'm happy with my choices. To be honest it's the handmade picture (hubs' Ooh La La print makes me smile) and the personal photos that make this space MINE. I've listed where the items came from in case you're interested. It all looks great and I love the little lights. I also struggle with things looking too plain but I really don't like looking at clutter either. I think you found a great balance. What a perfect little spot. Like Virginia Woolf says, for a woman to be a writer she really needs a space all her own where she can sit and contemplate. Enjoy! It's really pretty, really useful, minimilistic and yet characterful, a real achievement. And a good motivation to clear my little desk (in the kitchen as our home is small as well). a work space is such a good thing to have, i have created one for myself at the beginning of the year. The desk was £10 from ikea and the chair was free. Maybe i will do some photos? lovely and cosy, practical as well,you could spend hours there. What a lovely area you have created, it looks so organised too! It's fab! What a happy, bright and stylish little area you've created for yourself here. 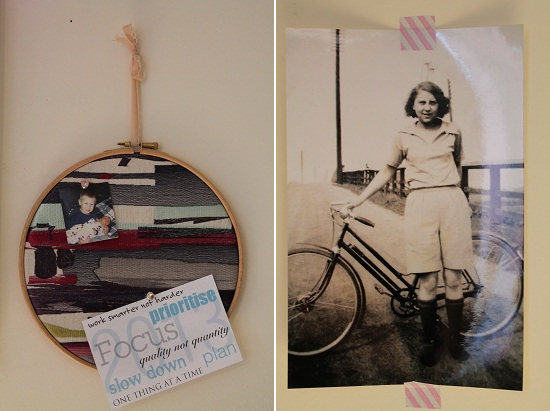 The spray painted eiffel tower caught me eye, and the fabric hoop pin board, what a clever idea. I have had similar frustrations with searching for that "perfect" piece of vintage furniture. Sometimes you need things like that now, not one day in the future. Lovely desk area Claire! 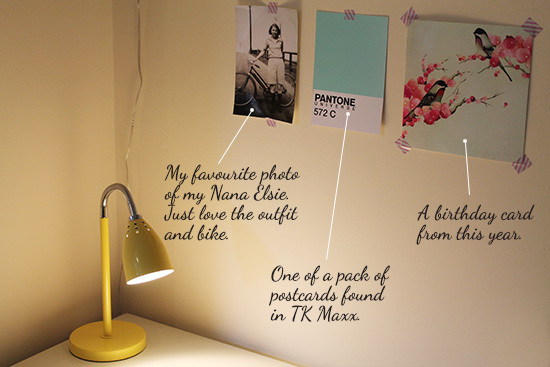 It displays items that are meaningful and/or inspirational with simplicity and flair. 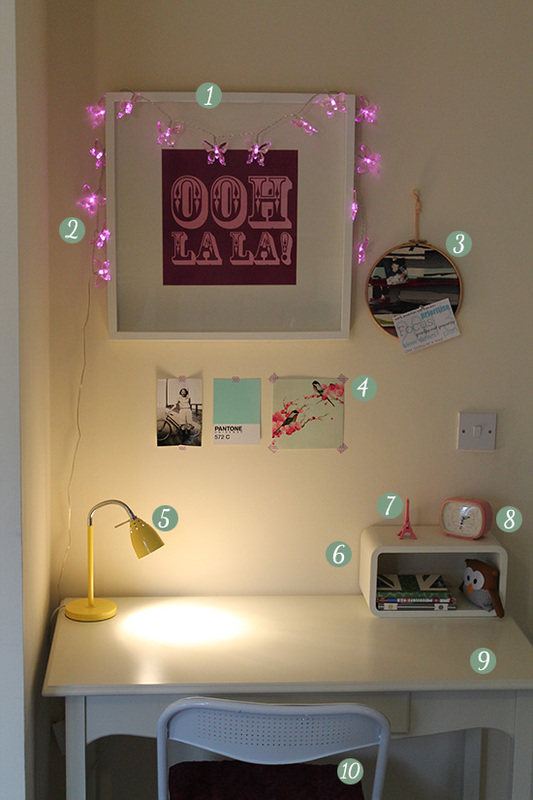 Your work area has a great modern vintage vibe; my favourite is the Pantone postcard! It looks so lovely! I love the desk - can't believe it was from Tesco's! 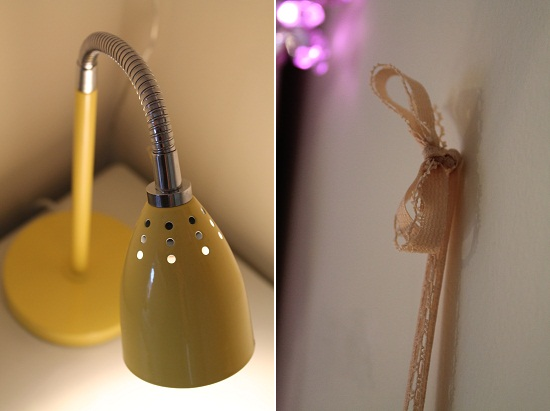 Your yellow lamp is an eye catcher. It can highlight your small desk and even the entire space itself.